Since 2005 San Antonio TX Mayors, Councilpersons, Law Enforcement Officials, Fire officials ( especially SAPD Chief McManus and SAFD Chief Hood) Judges, attorneys , the liberal media and many others have conspired to conceal the fact that ONE IN FOUR 911 calls fail on a regular basis, maintenance funding to repair the failing system was denied in 2006, communications funds had been stolen / misused for three decades via the City’s Avaya Telephone Contract / internal billing account - “the variable” and the 911 failures were being kept secret while citizens, first responders, military personnel and tourists suffered and died. 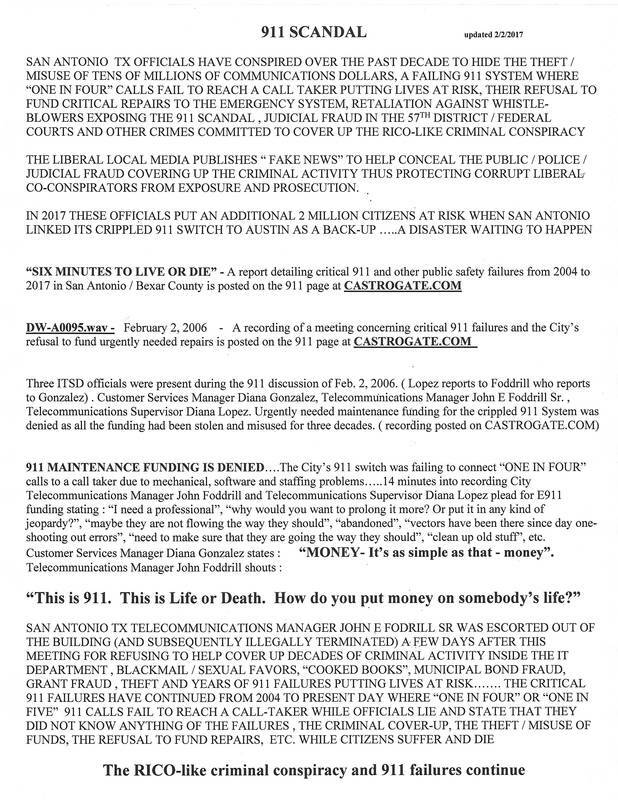 They and many, many others conspire to conceal the fact that City Telecommunications Manager John E. Foddrill Sr. was illegally terminated and defamed for refusing refusing to withdraw his reports of the 911 failures and refusing to participate in the ongoing RICO-like criminal conspiracy. As "protection" evaporates with President Trump taking office maybe the "fake news" will end thus allowing citizens to learn the truth. San Antonio / Bexar County TX citizens demand the criminal indictment of city / county officials , judges, attorneys , cops and others who conspired to conceal a DECADE of 911 failures where ONE in FOUR calls failed endangering tens of millions of lives. Citizens ask that a class-action lawsuit be filed on behalf of First Responders, Military Personnel, 31 million annual tourists and 1.5 million residents who were put at risk each and every year while city officials concealed the critical failures for the past TEN years. Maintenance funding needed to repair the failing 911 Emergency Communications System was denied by City IT Director Hugh Miller, IT Manager Diana Gonzalez and others in 2006 as all the money was stolen/misused for decades. City officials illegally retaliated against law-abiding whistle-blowers in an effort to conceal the scandal. In 2009 and 2013 officials used tax dollars to pay attorneys ( including the law firm of Fitzpatrick & Kosanovich) who defrauded the 57th District Court and the Federal Court thus hiding the ongoing criminal cover-up. In 2009 SAPD Chief William McManus , City attorney Michael Bernard ( brother of White House Social Secretary Jeremy Bernard) and others confiscated proof of the criminal activity, closed out police reports with no action, banned law-abiding whistle-blowers from City Hall / public meetings and instructed everyone to ignore citizens reporting the illegal activity. In 2016 KABB/WOAI finally reported the ongoing failures that whistle-blowers tried to expose for the past TEN years but allowed city officials to present false statements saying that they didn't know anything of the 911 failures / scandal….a LIE. City Manager Sculley, SAPD Chief McManus, SAFD Chief Hood, city attorney Bernard ( brother of White House Social Secretary Jeremy Bernard), Mayor / HUD Secretary Julian Castro, Councilmembers ( especially Cris Medina, Diego Bernal , Ivy Taylor ) and others violated the law , held almost four years of illegal meetings violating the Texas Open Meeting Act/US Constitution when whistle-blowers were banned to silence them, defrauded our Judicial System , “cooked” the books to hide the criminal cover-up, presented fraudulent financial statements to state/federal agencies , offered fake financial information to municipal bond investors and retaliated against law-abiding whistle-blowers exposing the critical 911 failures / theft of 911 funds instead of repairing the failing 911 System while people suffered and died. Bexar County District Attorney Susan Reed, First Assistant DA Cliff Herberg and others published false statements designed to stall any investigation while helping conceal the criminal activity. Since early 2015, recently-elected Bexar County DA Nico LaHood lied in official reports and concealed evidence of the 911 failures, the theft of 911 funds , the TOMA violations and the underlying criminal cover-up to protect his friends in local government and law enforcement. Police Union President Helle, Fire Union President Steele and the Deputy Sheriff ‘s Association “leaders” look away while making big speeches about public safety. The local media ( especially the SA Express News , KABB - Yami Virgin, WOAI - Jaie Avila, etc. ) publish “fake news” concealing the scandal. In 2017 officials in San Antonio and Austin Texas link their 911 Systems in an effort to provide back-up service in the case of service interruptions, natural disasters, terrorist attacks, etc. The act of having Austin 911 calls answered by the failing San Antonio 911 System puts the lives of Austin citizens, first responders, military personnel, tourists, etc. at risk. Correspondence detailing the ONGOING criminal cover-up of the 911 scandal is being forwarded to officials and news media organizations in Austin alerting them to the false statements, criminal acts and ongoing efforts by San Antonio persons to hide the 911 scandal. At fourteen (14 ) minutes into the recording one can hear City IT Manager Diana Gonzalez ( annual salary $95,000) REFUSING to provide urgently needed funding to repair the crippled 911 System that is failing to deliver "ONE IN FOUR" calls thus putting lives of citizens, first responders, military personnel and tourists at risk. This audio recording of a meeting that took place on February 2, 2006 PROVES that City officials were aware of the critical 911 failures and that City IT Manager Diana Gonzalez REFUSED to provide funds to repair the crippled 911 Emergency System. The 911 System continued to fail for the next DECADE while City officials lied and said they knew nothing while the local liberal media ( the SA Express News, KABB, KENS, WOAI, SA Current, La Prensa, KSAT, TPR, etc. ) REFUSED to publish the REAL facts about the critical failures putting lives at risk for over TEN YEARS. A review of a deposition provided by Telecom Supervisor Diana Lopez shows that funding was denied after Telecommunications Manager John E. Foddrill Sr. was illegally terminated for refusing to join in the illegal cover-up. Records show that "ONE IN FOUR" or "ONE IN FIVE" 911 calls failed from 2005 to present day putting lives at risk. City IT Manager Diana Gonzalez refused to provide maintenance funding to repair the crippled 911 System citing a " bad money year". The record shows that the long-term financial mismanagement and criminal activity inside the IT Department was being exposed by the City's new Telecommunications Manager, the adoption of the SAP accounting system, an audit of the IT Department's contracts, an audit of the city's 911 System , Municipal Integrity "investigations" of the internal billing account - " the variable" and other efforts to modernize the Department. The IT Department , the Fire Department and the Police Department failed at every turn. The new Telecommunications Manager became the scapegoat while long-term employees, criminals , IT Director Hugh Miller, SAPD Chief McManus, SAFD Chief Hood , City Manager Sheryl Sculley , City Attorney Michael Bernard , Councilpersons , city auditors ( especially Kevin Barthold) , "independent " auditors and other co-conspirators played along with the cover-up. SAPD is rated 2 on a scale of 1-5. 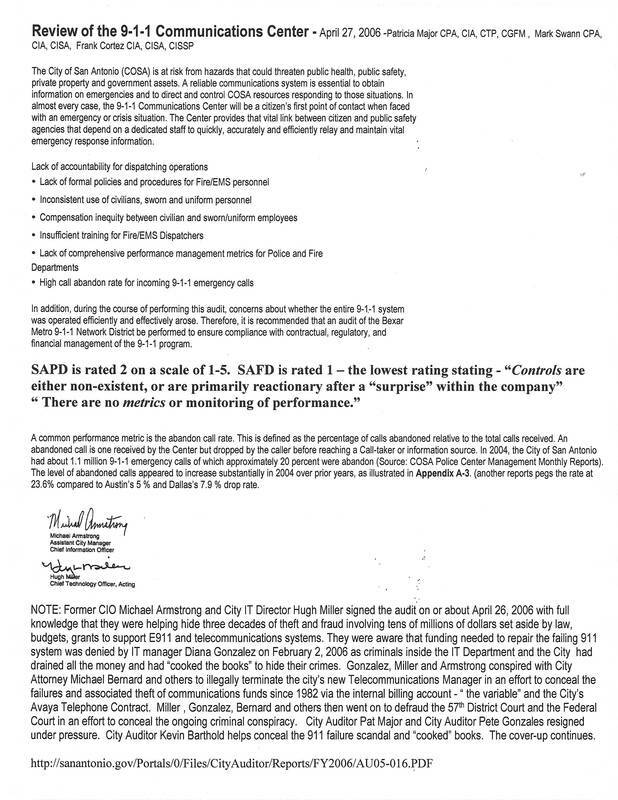 SAFD is rated 1 – the lowest rating stating - “Controls are either non-existent, or are primarily reactionary after a “surprise” within the company” “ There are no metrics or monitoring of performance.” ..............The City's new Telecommunications Manager - John E. Foddrill Sr. - is illegally terminated for refusing to go along with the criminal cover-up, the 911 failures and the City's REFUSAL to fund repairs of the crippled system.